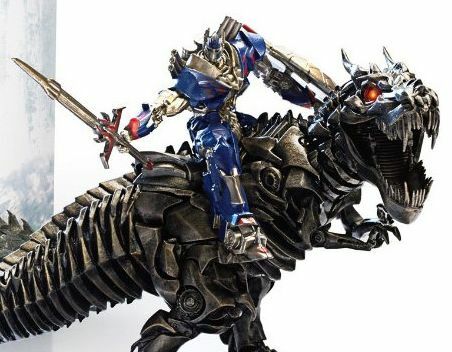 Even though the film has only been in theaters for a few days, Amazon has already revealed the Limited Edition Gift Set Blu-ray for Transformers: Age of Extinction which comes with a statue of Optimus Prime riding Grimlock. 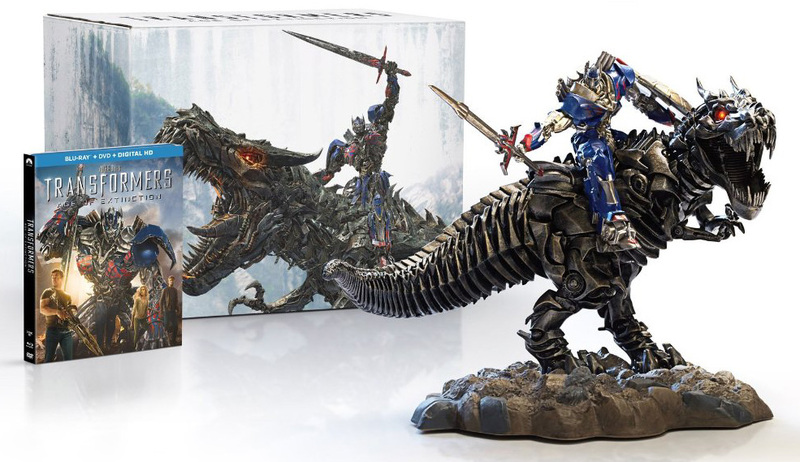 An Amazon exclusive set, the included statue was crafted using the same digital models used for the characters in the film. A hand painted piece, the statue stands over 7.25 inches tall and is over 9 inches long. Though it has no official release date yet, you can check out the set below and pre-order yours by clicking here! Directed once again by Michael Bay, the fourth film in the franchise stars Mark Wahlberg, Jack Reynor, Nicola Peltz, Stanley Tucci, Kelsey Grammer, Sophia Myles, Li Bingbing, T.J. Miller, Han Geng, Titus Welliver, Peter Cullen, Frank Welker, John Goodman, Ken Watanabe, John DiMaggio, Mark Ryan, Robert Foxworth and Reno Wilson. Transformers: Age of Extinction begins after an epic battle that left a great city torn, but with the world saved. As humanity picks up the pieces, a shadowy group reveals itself in an attempt to control the direction of history… while an ancient, powerful new menace sets Earth in its crosshairs. With help from a new cast of humans, Optimus Prime (voiced by Peter Cullen) and the Autobots rise to meet their most fearsome challenge yet. In an incredible adventure, they are swept up in a war of good and evil, ultimately leading to a climactic battle across the world.